It is important to understand the different aspects of zazen posture to avoid forcing the body into static rigidity contrary to its natural physiology. Instead, there is balanced relaxation in the vertical position of the body during zazen. 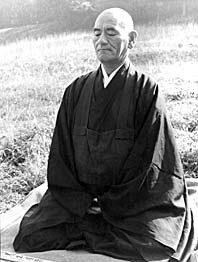 Zazen is practiced while seated on a round cushion known as a zafu, and the size of the zafu required will depend on the physiology of the practictioner. The positions of the pelvic and hip bones are key. The correct balance is achieved when sitting on the middle of the zafu with both knees planted firmly on the floor. 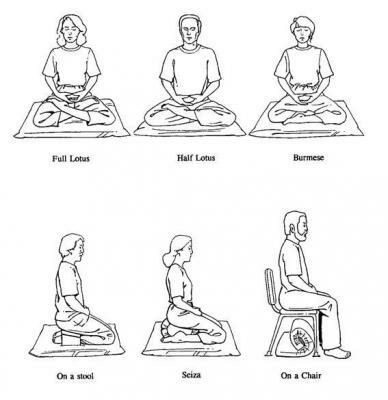 The legs are placed in either lotus, half lotus, or another of the positions pictured below. The correct position of the pelvic bone and the ideal sized zafu allows the spinal cord the space to stretch toward the sky without causing detrimental tension in the back and spine, and for the head to be relaxed and straight. The shoulders, the rib cage, and the inner organs are also relaxed such that the breath becomes unimpeded and natural. The eyes are half open, half closed, and the gaze is lowered at an angle of about 45 degrees. The wrists rest on the upper thighs, with the fingers of the left hand placed on top of the fingers of the right hand. The palms face upwards and the thumbs touch gently and firmly at their tips. The insides of the hands touch the abdomen. During zazen, the practitioner must pay vigilant attention to every detail of the posture as well as the breath. This attention creates unification of mind and body. The usual flow of inner monologue is interrupted. Thoughts arise, as is their nature, but if the attention is still focused on the posture, then thoughts disappear without leaving a trace. Naturally and unconsciously the ego´s willpower becomes inactive and no longer searches for a goal. All that remains is the present moment. It is impossible to see one´s own posture, so it is easy to fall off track without knowing it. 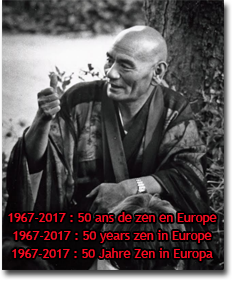 As such, it is important to practice with others, particularly in a dojo ("the place of the way") where it is possible to receive the advice of an experienced practitioner.